Philly Pretzel Factory wants to take the distinct taste of the Philadelphia soft pretzel to the rest of America and around the world. Its first international store is set to open in Nassau in the Bahamas by the end of this month. The franchisee opening in Nassau already owns three pretzel stores in Pennsylvania and New Jersey. 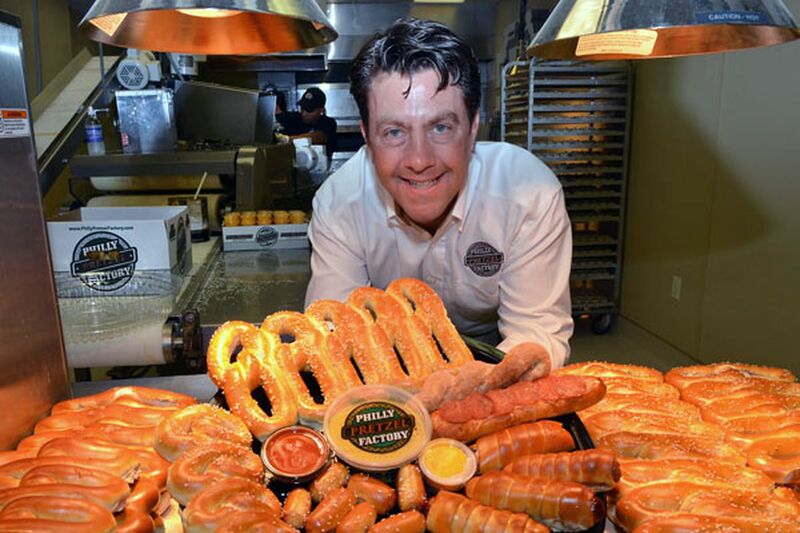 "I get e-mails all the time from people all over the world who want to open a franchise," said Tom Monaghan, Philly Pretzel's first chief development officer. Monaghan, 49, formerly chief executive officer of Griswold Home Care, joined the pretzel company on March 16 to manage its expansion. The regional pretzel purveyor hopes to grow from 153 to 500 U.S. stores by 2020, but there's no target for international outlets. "As for international, we are more concerned with finding the right person rather than the numbers," Monaghan said, noting franchisee inquiries have come from Canada, Mexico, and even China. "The right person has to be passionate about the product and can deliver the same quality and service as our U.S locations." David Allan, a marketing professor at Saint Joseph's University, foresees some challenges for Philly Pretzel Factory. "Unlike the cheesesteak, Philadelphia doesn't exactly own the pretzel, something everyone is familiar with. So, Philly Pretzel Factory will have to make itself a distinct brand in the pretzel category," Allan said. To cater to local taste buds abroad, Philly Pretzel might consider changing the sauce flavors or reduce the salt on its soft pretzels, Monaghan said. "Maybe if we're in India, they might not like mustard, so we'll create a sauce that caters to their taste buds, but our main product - the soft pretzel - will remain unchanged," Monaghan said. Back home in the United States, Philly Pretzel is targeting geography where the most potential franchisees are or where a franchisee is opening more than one store. Because Philly Pretzel's stores are concentrated in Pennsylvania and New Jersey, it has plenty of room to expand its regional pretzel business. Of the pretzel maker's 153 U.S. stores, 70 are in Pennsylvania - 25 in the Philadelphia area - and 40 in New Jersey. The chain has grown from 111 stores five years ago. Revenue last year for Soft Pretzel Franchise Systems Inc., owner of Philly Pretzel Factory, was $50 million. The company's goal is annual revenue of $200 million by 2020. "We've seen growth in revenue every quarter of every year. More store openings each year. There's also demand for our product," Monaghan said. Philly Pretzel dates to 1998, when Dan DiZio and Len Lehman started it in the Mayfair neighborhood of Philadelphia. The first store is still there, and there's also a corporate office and employee training facility on the site. Allan, of St. Joe's, thinks the company's ambitious goal of 500 pretzel stores in the next five years is feasible. "They've got to expand quickly - if not, another brand is going to do it. Unlike a full-service restaurant, they have lower overhead costs, so it's cheaper and easier to open and manage a store," he said. Philly Pretzel charges a franchise fee of $35,000. With the franchise fee, construction and ingredient costs, and equipment expenses, stores can cost $130,000 to $355,000 to open, Monaghan said. Franchisees set the pretzel prices on their respective menus. Philly Pretzel only has to look west to Chester and Lancaster Counties to see how one of its soft pretzel competitors has appealed to consumers nationwide and abroad. Auntie Anne's, started by Anne Beiler in Downingtown in 1988, is known for its hand-rolled, hot-buttered pretzels. It opened its first international outlet in Jakarta, Indonesia, in 1995, and now has 1,073 locations in the U.S., and 479 overseas. Auntie Anne's was acquired by Atlanta private equity firm Focus Brands Inc. in 2010. "Auntie Anne's has been successful in expanding globally, but did experience a few challenges early on. Sourcing certain types of ingredients in other countries and the cost and ease of shipping was prohibitive," said Heather Neary, vice president of global marketing at Auntie Anne's headquarters in Lancaster. "We also learned we had to market our products differently outside of the U.S. While a pretzel is a common snack here in the U.S., it's not a common snack all over the world." Philly Pretzel augments its retail stores by selling pretzel party trays for events and special occasions, and specialty items such as hot dog-wrapped pretzels and pretzel cheesesteaks. Monaghan views the catering business as an important piece of the expansion. "Despite different cultures or different taste buds whether nationally or globally, as long as Philly Pretzel Factory continues to produce a quality product, they will succeed," Allan said.